Cargo carriers are an essential custom truck accessory for any vehicle. Cargo carriers can attach to the roof of your vehicle or to the receiver hitch on the back of your vehicle. No matter what you choose, these carriers allow you to free up space by holding luggage and other cargo outside of your vehicle. The days of over stuffing your car with luggage, food and family are over. A cargo carrier is simple to install. If your looking to mount your carrier to the top of your ride simply add it to your existing roof racks or cross bars. Most rooftop carriers are waterproof and will protect your cargo in a rain assault. A hitch carrier is very easy to install and simply slides into your receiver hitch. Whats nice about this option, is you can easily remove the rear cargo carrier when you're not hauling. Plus, it makes parking in tight places easy. 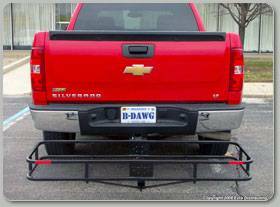 B-Dawg carriers make high quality hitch carriers, bed extenders, motorcycle carriers and mobility carriers. Check out our huge selection for bottom of the barrel prices and stop stacking the family on top of each other when you head out on vacation. Hitch Carriers at the lowest prices online! Order online or call 1-720-242-7322 for more information.